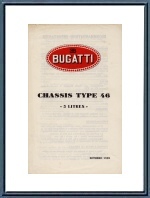 1929 Bugatti Type 46 "Quick Start" Instruction Sheet. 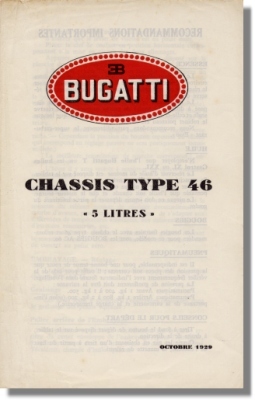 Here we have a vintage October 1929 "quick start" sheet for the Bugatti T46 3 Liter cars. It is not very elaborate but gives simple instructions on how to operate and maintain the Type 46 chassis. It mentions fuel, lubrication, spark plugs, tires etc. It looks like it was an insert for the extended owners manual and aimed at those who didn't want to go through the whole manual before taking their new Bugatti to the road. Kind of like what we find nowadays with electronics. The sheet measures some 14 x 22.5 cm (5.5 x 8.9 inches) and opens up to 28 x 22.5 cm ( 11 x 8.9 inches) with 3 pages of text.